Musician and actor Jamell Richardson was born in Mississippi and raised in Butler, Alabama, and later moved to Mobile, Alabama. At the age of 2 Jamell Richardson a.k.a. ‘Gulf Coast Blues Boy' found his niche for music and would begin his quest to have a brighter future by playing the guitar. Richardson is a rising star who has shared the stage with various legends of the Blues. His music is influenced by various genres of blues, jazz, soul, gospel and Hip-hop, as well as various artists such as B.B. King, Jimi Hendrix, Eric Johnson and Marvin Sease. Richardson remain grateful to have had his debut acting role in the new film “Get On Up”. The film is based on the life of James Brown. In the film he plays Jimmy Nolen, the lead guitarist in James Brown’s band who developed the picking of the guitar string known as "chicken scratch." Richardson’s story concerning how he landed the role in the movie is very interesting. While going to the callback audition for the film with a friend, Richardson was noticed by one of the producers of the film who quickly approached him. The producer asked Richardson to look at the photography on the wall behind him, as he favored one of the members from the band. Getting the thumbs-up from his friend encouraging Richardson to audition for the part, he did so. Nonetheless, the audition was said to be over, Richardson was eventually given the role to play Jimmy Nolen. Here is what Jamell Richardson had to share during a recent interview with Consciousness Magazine regarding his music and acting career. 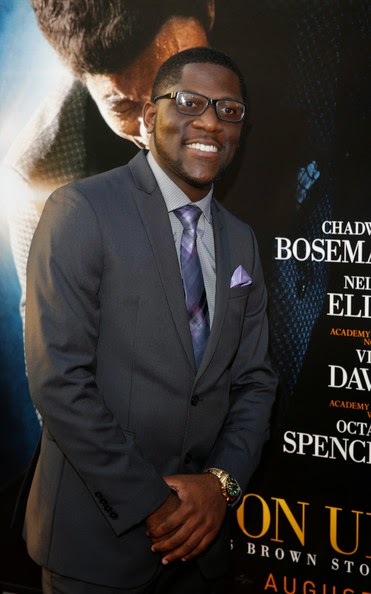 Aaron Robinson: What was it like for you to portray the character of Jimmy Nolen in the new film “Get On Up”? Jamell Richardson: Being that I am already a guitarist and most of my friends are musician singers, it came natural. It was pretty cool being a guitarist. The whole acting thing was my first time; it just kind of came natural. Aaron: You have worked with so many talented actors and actresses on the set. Who were some of the cast members who made a significant impact on your life and why? Jamell: I would say the biggest impact would be Tariq Trotter, who is Black Thought from The Roots. On and off the set he just opened his arms up to me. Soon after the set, I went out to Philadelphia to some of his shows and he would invite me out and just treat me real good. Aaron: Did you learn anything new about James Brown? Jamell: Yes, definitely. On set we had to actually learn his music and guitar lines. We spent hours of rehearsal and learning [his music]. James Brown had simple music but everybody played parts. That’s what made his sound such a unique sound is because everybody played their different parts. A lot of it is discipline. It’s simple, but at the same time it can be hard if you don’t know how to be disciplined. Aaron: You are also a musician who goes by the name Gulf Coast Blues Boy. What was your inspiration in wanting to pursue music? Jamell: Well, growing up in the church. I’m a church boy by the way. My grandma was a pastor. She is deceased. [My inspiration] came from always being around those old church musicians. When I first heard the first lead guitar, it just stuck in my head and that was it. My grandma bought me my first guitar at the age of two and I just stuck with it ever since. Aaron: How do you balance both of your careers, acting and music? Jamell: Well it gets kind of…the acting part of it is really more of a hobby to me. Music is really my livelihood. The music and just my gift for playing has made room for me in many different areas; I’m just so thankful for the gift of music. Aaron: What’s one thing that you would encourage aspiring actors or singers to be mindful of while looking to make a name for themselves in the entertainment industry? Jamell: Well, first off I would like to tell them to just…one of the main things is that you have to put God in front, regardless. Make him the head. Take negative energy out of your life - negative people that are not trying to strive and go the direction you are trying to go. You gotta cut them off. Sometimes it’s going to be hard. Some of them are going to be your family members…somebody who just want to see you down. Work hard, set goals and just work toward them. Aaron: Great advice, great advice. Can your fans, listeners, and viewers expect any new projects from you in the future? Jamell: Yes, indeed, indeed. I’ll probably be releasing my next album in November. I’m not sure on the release date but I’m setting out for November. I don’t know what I’m going to call it yet. You can find me on Facebook (https://www.facebook.com/mellymellgtr) and all that stuff, instagram (http://instagram.com/mellymellgtr) Twitter (https://twitter.com/JJamell). Aaron: Would you like to add anything in closing before we conclude the interview? Jamell: I would like to remind people that when the favor of God is on your life and you are at the right place at the right time can’t nobody stop you. That’s my story, that’s how I got started acting.